After the great Texas blizzard of 2017 the remaining frozen indigo needs some attention. You can see how much indigo remains in the Indigo Suffrucitosa. I will pick and strip them before the winds take them down for me. My day will be spent slowly trimming more branches in anticipation of the winter winds. Slow is the operative word as I am still recovering from an October back TLIF surgery. I’ve graduated from my cane, I can start driving in a limited basis and start physical therapy next week to restore my core strength. I had a major victory this morning when I could lace my boots myself. My husband is glad to see me further along the recovery road also. I had a set back earlier this week when I tried to do too much too soon. My body set me straight yesterday. Patience is not one of my virtues. 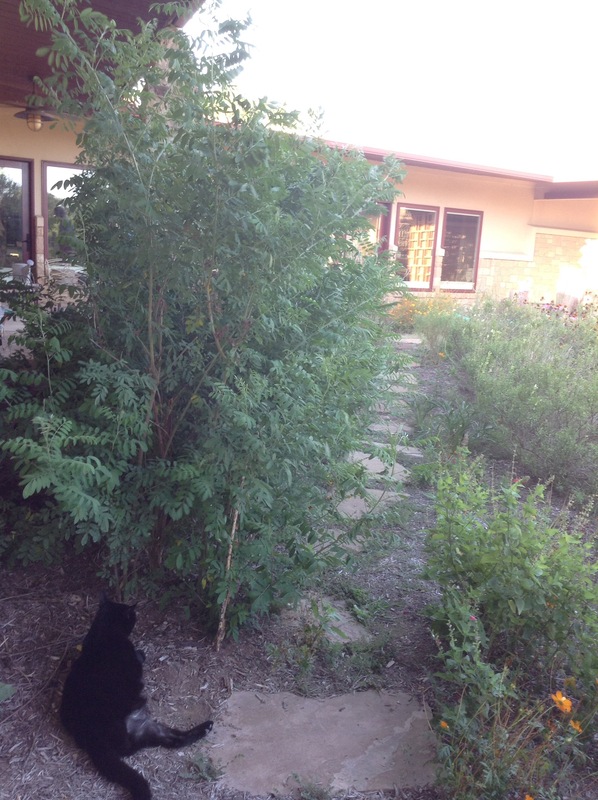 Gardening and the dye pot help some. Besides harvesting the frozen leaves indigo the seeds have matured and need to be gathered, dried and winnowed. I am amazed to report that this year’s volunteer crop outside the fence line did not get a nibble this season from the ever insatiable deer herd. Next year I will get more ambitious and purposely plant seed along the irrigation line. The test bed on the west side did well above my expectations. It was exposed to the hot August and September sun and held up. More will be planted there next year. I think regular irrigation will make that a viable bed for future use. The Japanese Indigo has gone for the season. The seeds are drying and the bed needs to be cleared. The critter that cannot be caught waited politely thru the growing season before making an incursion under my Fort Indigo fence. We will continue our quest to capture & relocate the grub digger. Wishing everyone a Happy Holiday and a New Year as the year draws to an end. If I decide to sell seeds for next spring I will post here. Enjoy your garden dreams for 2018. 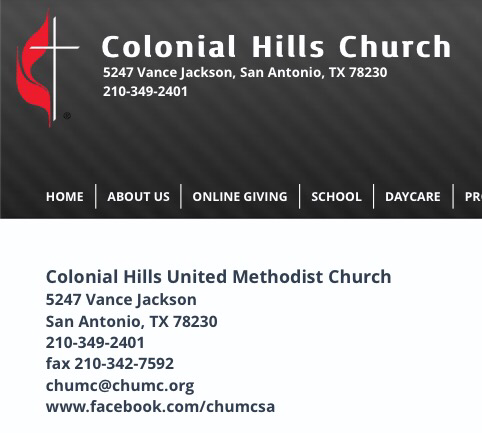 We have frost in our Hill Country weather forecast this weekend. 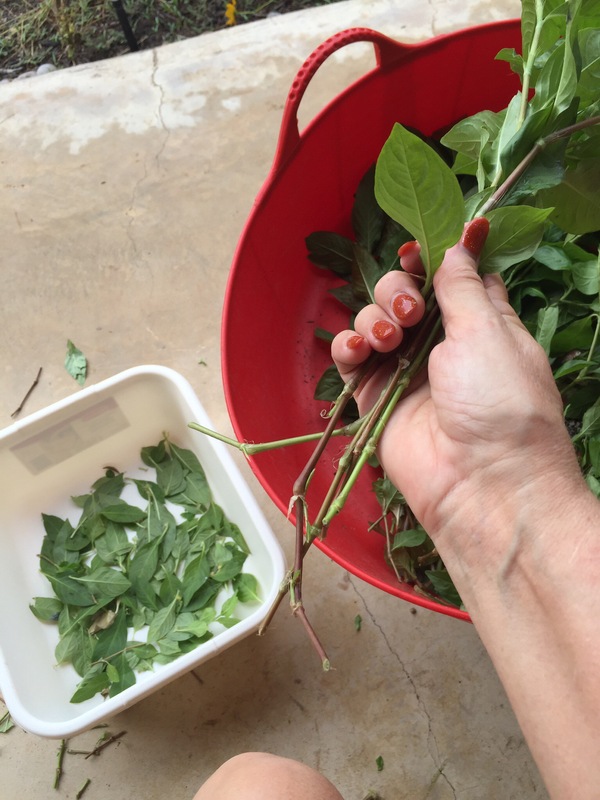 With my recent back surgery I can’t go into physical overdrive but with my husband’s help I can pull in both indigo species seeds for drying and trim some Indigo Suffruticosa leaves to dry. 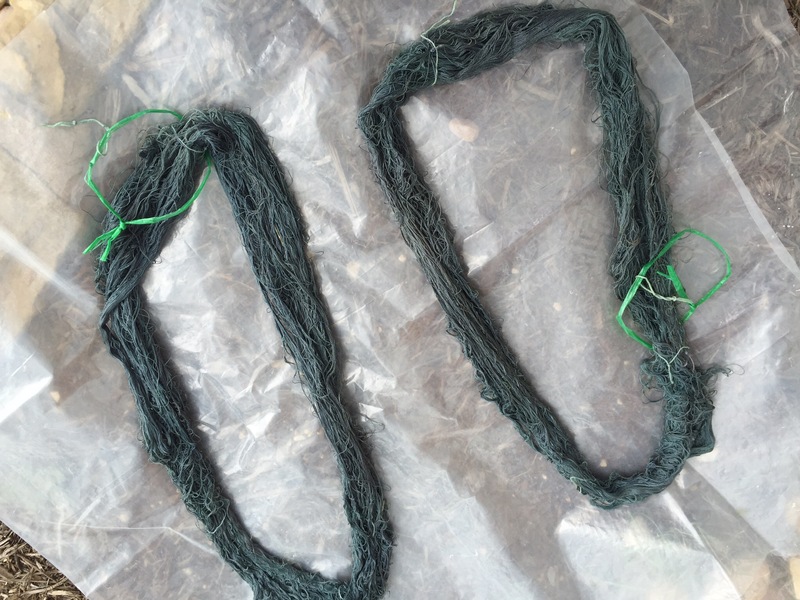 The Japanese Indigo seeds below are set out to dry before separating from blooms. There is another leaf bed to harvest but I am saving those for a John Marshall study group project. Hopefully, the freeze is just a forecast not a reality. Above are the banana shaped Indigo Suffrucitosa seed pods. See the black seeds peeking at you? And finally the leaf stripping station. Truly high tech, I strip the leaves off the stems. Easier now rather than later. 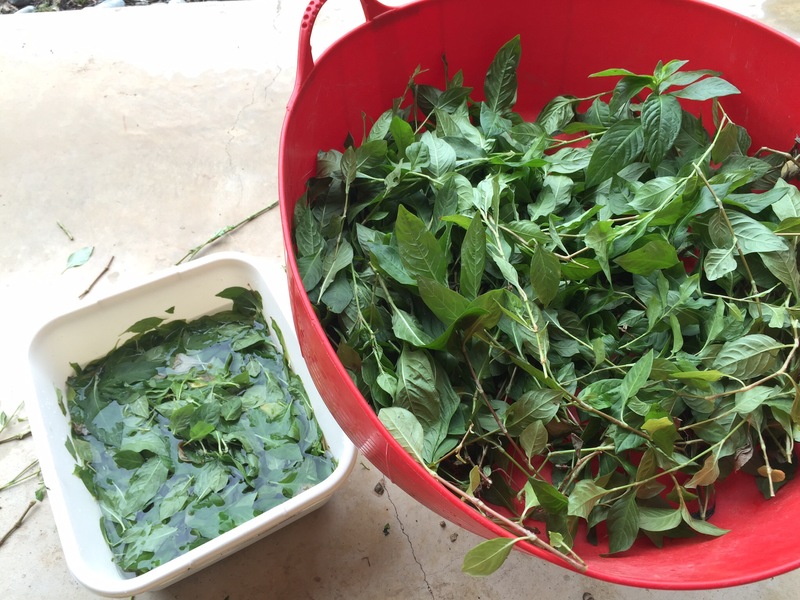 The fresh leaves will be weighed and after drying I’ll weigh the yield. Like that back brace? It will be my friend for the next 90 days while my bone grafts heal. Oh goodie. This batch will go into my leaf drying mesh bag and left out for a couple of days. By then the bugs will decamp and I can transfer the batches to rubber tubs for long term drying indoors. These tubs show dried batches from earlier this year. All are Indigo Suffrucitosa except the lower right hand which is Japanese Indigo. In the end the process is easy to fit into my lifestream and I can focus on growing the indigos, dry them and run dye pots later. Its all about focus at the proper time. I’ve been collecting quantity stats to see what amount of color I can expect each season. The indigo left on my plants today will probably be my freeze dry stash for the year. We trimmed the plants for the winds so here’s hoping for a dry hard freeze when old man winter does hit. Here is a photo from last year’s freeze dry experiment. It worked! 100 grams yielded this color on 340 grams of silk. Granted it is not a dark blue but I am testing the process for my Indigo Suffruticosa that works for dried Japanese Indigo. It worked well enough that next time I am cranking up the dry leaf quantity to see how blue I can go with dried indigo, more words on that in another blog entry. And of course, these skeins will go in to get darker. In the larger scheme of dye life it is about what colors you can grow, the easiest process to use what one harvests and how to get darker colors and fitting it into your daily rhythm. We do it because we can. Enjoy your harvest. As I continue my presentation and prop review for my talks next week at the Contemporary Handweavers of Texas I giggle with delight at some of the tricks the Cambodian warping family taught me on Koh Dach Island. Here is one of my favorites, the warping puddle of fine silk in preparation for winding onto the back beam….. This is one of the clips from my Cambodian Textile Tools talk…..not only tools but the relationship between the weaver and their equipment. Explore the natural history of color while learning contemporary application techniques. This talk will include practical aspects such asbinding agents as well historic uses. 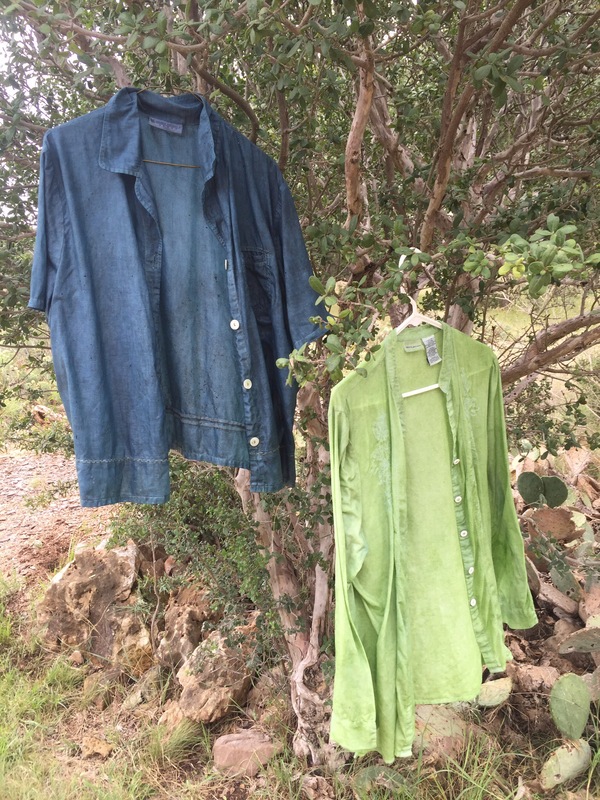 Participants can view examples of the colors produced by Texas lichens, cactus tuna, cochineal, Texas agarita, and more! 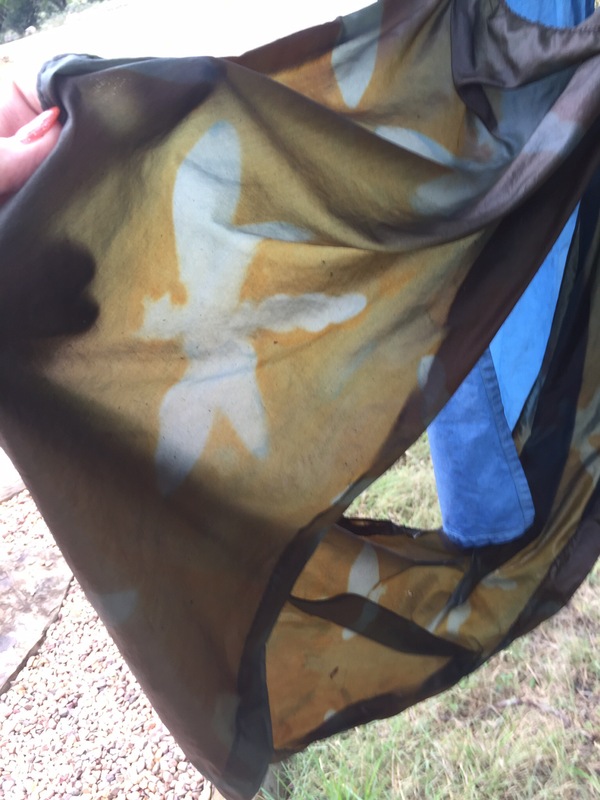 For centuries, people have used natural dyes using locally available plant, mineral and even insect sources. Today, choosing natural dyes over the chemical alternative is becoming more popular as we move toward more sustainable ways of living. This workshop is presented by Deb McClintock, local artist and textile designer. For more information, call (210) 207-3782, or email nicole.mcleod@sanantonio.gov. Suggested donation: $3 per person, or $6 per family. 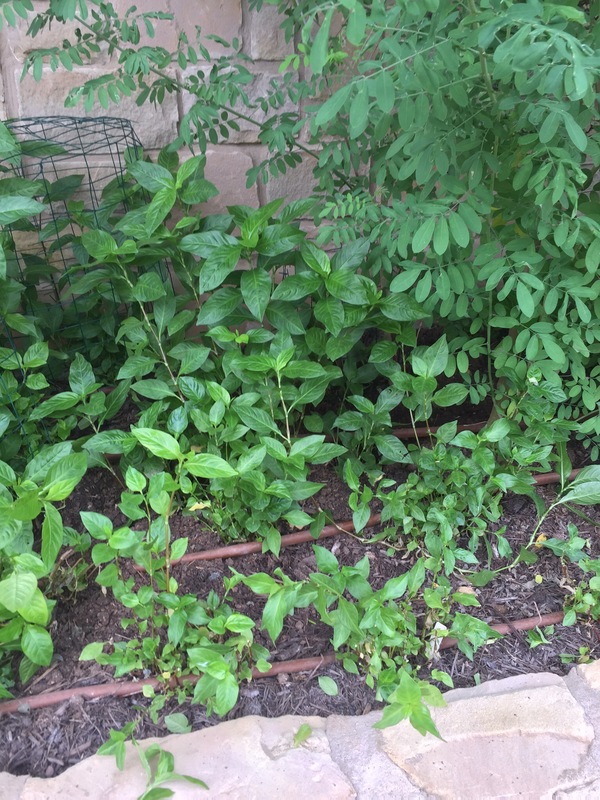 The cage is to keep the raccoons from digging for grubs around my Japanese Indigo. I ended up with eight bundles of JI to dry. These leaves will dry over the next week as our temps jump back up and be stored for more dried leaf dye experiments. I used the shorter cuttings and trimmings to do some blender indigo. I couldn’t bear to let any indigo leaf go to waste! I keep the JI leaves in iced water until I could get to them. I then trimmed out my Indigo Suffrucitosa to put another batch into a soak. That trimming yielded about 1700 grams of leaves. 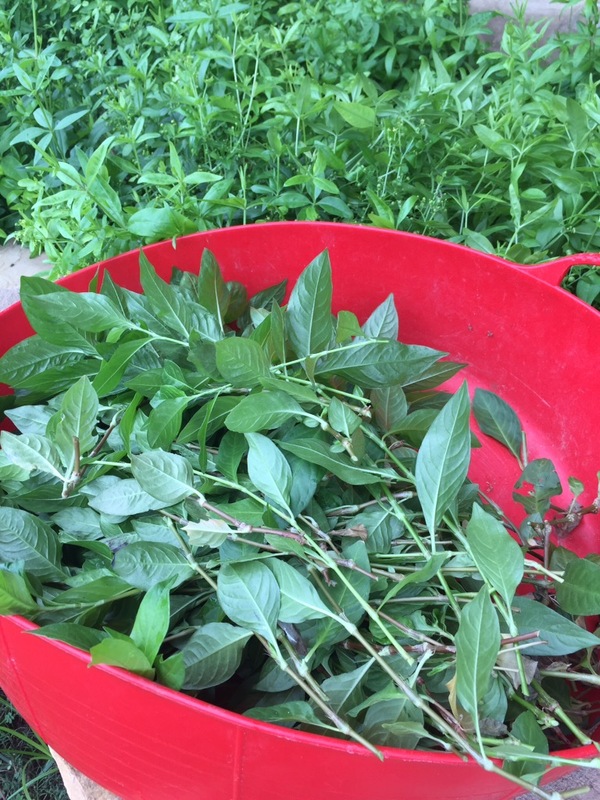 They’ve been tucked in a tall pot, given water and sat aside to soak a couple of days to free up the indigo from the leaves….rot it out! There was another IS batch prepped this week and proved itself an indigo pot. I added slaked lime and some solar ground madder root I had on hand to help reduce the pot, looking back at yesterday I tested some napkins and the pot proved ready to work. Here’s yesterday’s results from Indigo Suffrucitosa reduced with rotten madder root with a ph kick of slaked lime. 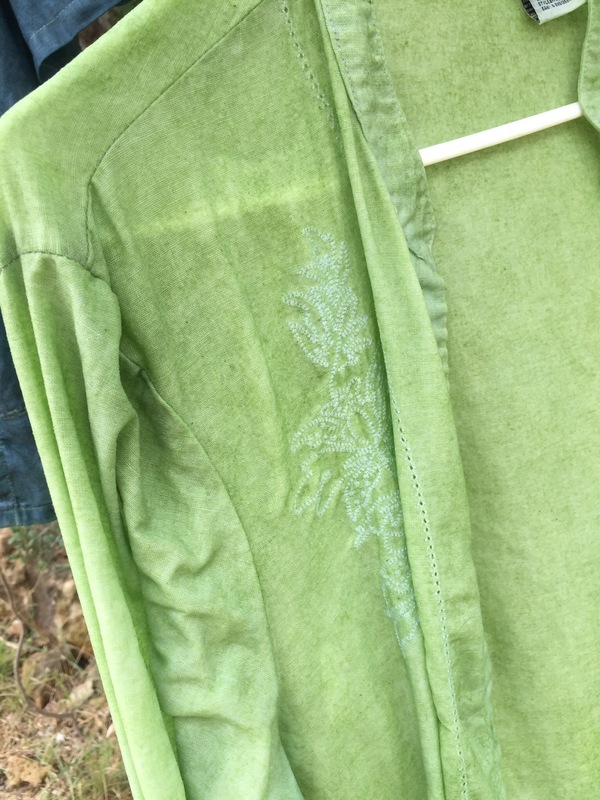 Today I dipped a linen shirt I found in a Santa Fe thrift shop, it came out a great dark blue after two five minute dips and a hour oxidation between the dips. 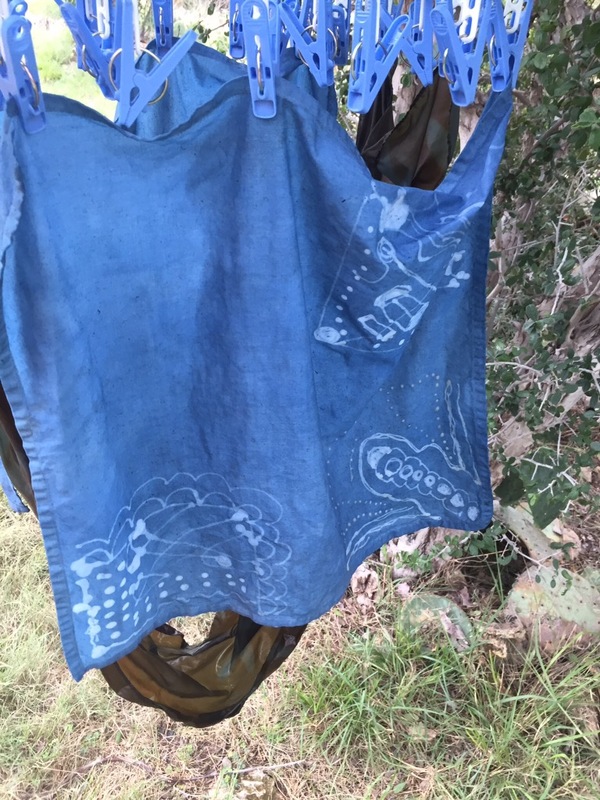 Turning my attention back to the iced Japanese Indigo I popped it thru the blender and filtered it to keep the mashed leaves out of my dye bath. 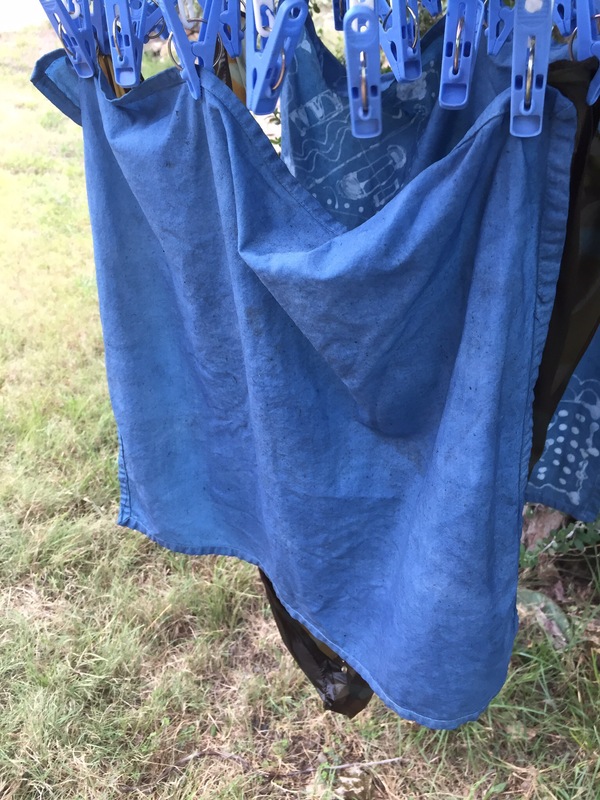 I had an indigo shirt which had faded with washing so I wanted to freshen the color. It will show as green but will shift to indigo blue slowly. It is another white shirt I picked up at a thrift store that needed a new life. Finally, earlier this year I believe I posted my silk skeins that turned a mystery purple/lavender. I popped those in the blender indigo to overdue the lavender to shift to the more traditional indigo blue. Here’s the before & after! These skeins might go into the IS pot with some other skeins from last year. Layering the blues makes them so rich! Or I might stop with this blue. 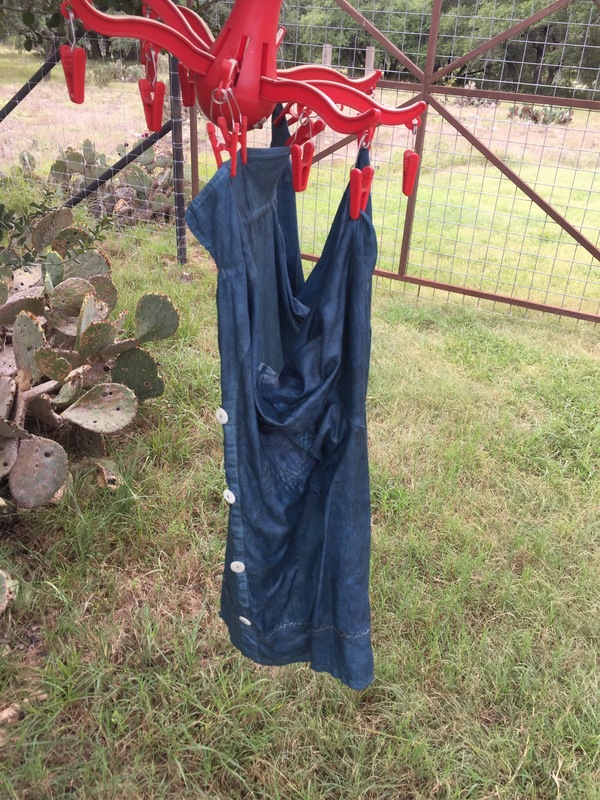 It depends on how they level out after washing. 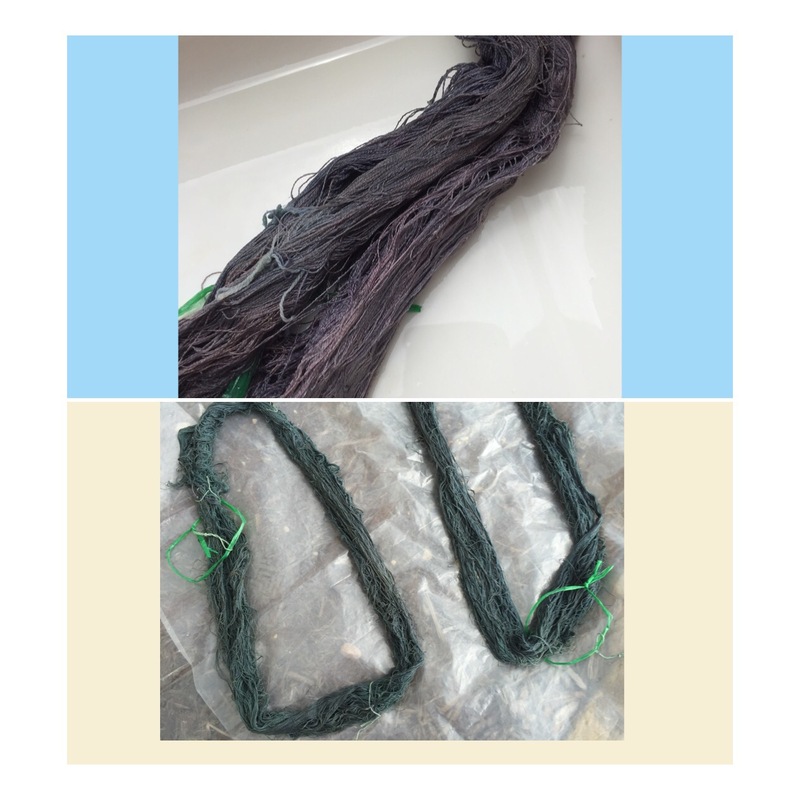 So….from my Indigo Suffrucitosa on the left I get the deep blue and on the right I get my Japanese Indigo green. It will slowly shift to the indigo blue we know. All of my materials are oxidizing now to strengthen the indigo bond and I will neutralize all with vinegar bath tomorrow so the slaked lime high ph will not weaken the goods. A good day clearing the garden and catching up on some dyeing! 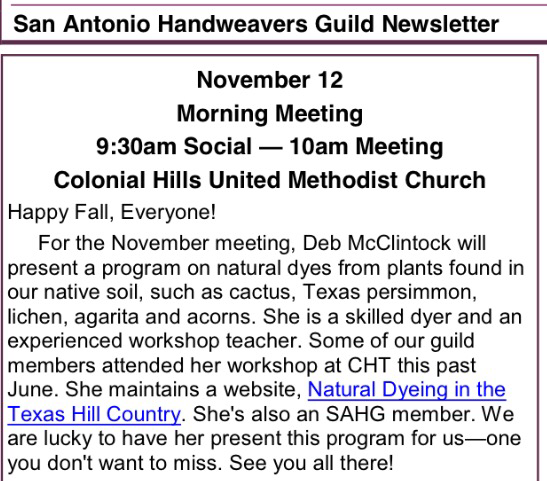 If you are around San Antonio on Nov 12th I’d love to meet fellow dyers… I am speaking about natural dyes I use from my valley & garden!